Political, Situational, and other News Affecting Wentzville, St. Charles County, St. Louis Metropolitan, Missouri, and the Nation as a Whole. The New Wentzvillian will be following all of the Wentzville Alderpersons' activities on a continuing basis. Our editor recently requested interviews with each and every one of the Wentzville Aldermen. So far Alderpersons Kross and Shryock have met for discussions and the New Wentzvillian is very thankful. Forest Gossett and Michael Hays have agreed to meet soon. However, Chris Gard and Rick Stokes, so far, have ignored New Wentzvillian requests to meet. We hope Aldermen Stokes and Gard will quickly set up appointments with our editors. In the mean time the New Wentzvillian would like to hear from any Wentzville citizens (or others) who have information to share about Alderman Rick Stokes. We are very keen to hear ANYTHING relative to Mr. Stokes since Alderman Stokes has recently told the New Wentzvillian that it is not allowed to communicate with him at his work email address. Frankly, the New Wentzvillian's objective is to draw down a spotlight on each of the alderpersons in Wentzville that seem to be giving Wentzville's mayor a difficult time with his agenda. This past year, Mayor Guccione won his election with a very convincing margin and has A LOT of political capital relative to the voters of Wentzville. It seems that many of the current alderpersons pushed heavily for another mayoral candidate in that election -- even collectively riding on his float during a parade -- however, their efforts evidently did not bring about their desired outcome. Apparently this did not set well with many of them and they either consciously or subconsciously want to punish the winner of the election -- Mayor Guccione. This is no witch hunt; rather, it is an attempt to correct what the New Wentzvillian sees as shameful inequities. Inequities that stem from some of the aforementioned aggrieved aldermen shamelessly ascribing to the malicious and reckless musings contained in another local Wentzville blog. A blog that cares nothing about fair and balanced journalism, and instead focuses on rumor, hatred, libel and wanton disregard for any attempt at objectivity or truth. Please assist the New Wentzvillian in formulating fair and balanced coverage of each of Wentzville's fine alderpersons. Please email us at carter@NewWentzvillian.com or Call us at 636-916-4040. The New Wentzvillian knows Mr. Marshall's assertions about the mayor's free speech rights are beyond non-sensical. The New Wentzvillian's Editor taught communications law for years at Mizzou -- still can -- and still teaches at University of Missouri St. Louis. 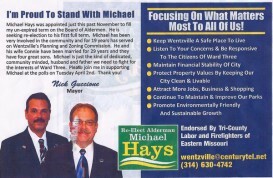 The Mayor's First Amendment Right of Free Speech cannot be abridged for the ludicrous reasons mentioned by anyone who has called question to the Alderman-Hays political flyer (pictured below) wherein Wentzville's current mayor supported him. The mayor is not giving up military secrets, yelling fire in a theater, or any of the classic reasons that Constitutional Scholars (and Supreme Court Justices) agree rise to the level of possibly abridging Poiltical Free Speech. Just the same as Senator John McCain, President Obama, and city Mayors across the United States endorse candidates EVERY ELECTION CYCLE; Mayor Guccione can do the same without concern. Again, Political Speech is THE MOST PROTECTED form of speech in the United States -- Just ask the ghost of President Adams what his BIGGEST REGRET WAS: Alien and Sedition Acts that attempted to abridge political speech. The New Wentzvillian is QUITE CERTAIN THE CITY'S ATTORNEY -- PAUL ROST -- WILL SET ALL OF THOSE INVOLVED STRAIGHT VERY SOON!!! If anything, Larry Marshall's (resident mentioned in Wentzville Patch article) blog has many instances of untrue statements that show MALICE and very likely WANTON & RECKLESS Disregard for the truth. As a holder of a Master of Journalism from Mizzou, the New Wentzvillian's editor would like to think muckraking is fine/tolerated in the blog world (since many many readers don't believe the B.S. in them) and should be left alone, but given that the New Wentzvillian takes a very real interest in Wentzville ongoings, we are keen to track Larry Marshall's journalistic pursuits.